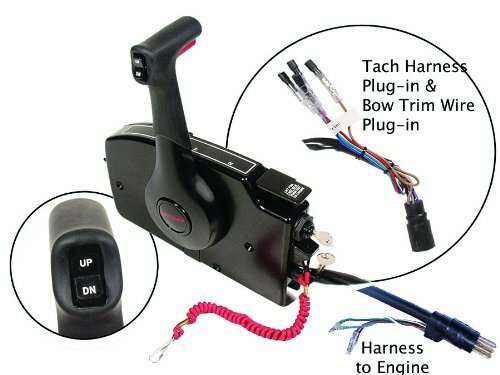 For power trim models, 15 ft.(4.58 m) harness and built-in warning horn. New design which includes soft grip and power trim leads for front mount switch. Fits all current Mercury/Mariner outboards (with integral power trim) and 1993 and newer Force outboards 40 hp and higher utilizing Mercury style cables (with power trim). When used with MY2005 and newer 8/9.9/15/20 four-stroke outboards an adapter harness 84-892473A01 is required. Remote Control cables need Gen I style to connect to control box. I bought these to replace the old plastic quicksilver controls on by Bass boat. I have a 90 Hp outboard. These control are much better then the original plastic housing controls with the push button cold start(always had trouble with it working). These control are metal very well built. Instruction where great that came with them. It only took a couple of hours to get them installed and working. My older quicksilver control had a separate wiring harness for the remote trim switch on the handle. This unit has that integrated into it's harness. The cold start is a flip lever not a push button type so it eliminates the problem I has having. I would recommend this control to anyone.